and behaving erratically . . .
Blessings on you all, whether you are opening to the fullness of summer solstice light, or to the seeding of a new cycle in the winter solstice dark. Every year at this time I make a solstice mandala. This one is for you. May there be peace in your homes and love in your hearts. Thank you for your good company through 2017, for your comments, appreciations, & insights. From December 17 I will be on holiday. If you check my Facebook books page on Dec 21 or 22, I may be able to post some suggestions for a simple summer solstice ritual. I look forward to being with you again in 2018 after drifting into the rhythms of summer in the bush and beside the sea. thank you Juliet, and enjoy the sea and bush! And you too, Ree. I hope you have a relaxing break. So right for this time of year. Have enjoyed all of your creative pieces over the year. You show what is possible! Ruth, thank you so much for your kind words! Have a wonderful solstice. Kate, thank you for your appreciation! Have a happy solstice. I have really enjoyed reading all your wonderful season aspected rituals and insights. I wish you the best for soltice. I look forward to enjoying more and being able to contribute to this blog and your Facebook page. Blessings, Denise. Thank you Denise. I have enjoyed your contributions too. Blessings to you and yours this festive season, dear wise Juliet! Your gifts are always deep and sound and wonderful. Thank you! Kathryn, how lovely to hear from you. Thank you so much for your kind words, and I send blessings to you too! 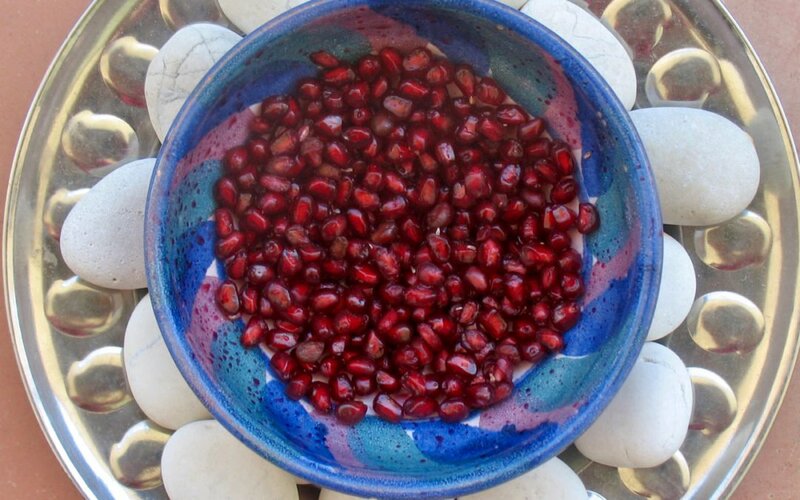 May you taste the pomegranate sweetness, wherever you may be in the world. A beautiful summer solstice mandala. I am slowing down as I read through Touching Snow. Amanda, thank you, and I’m glad that my childhood memoir is slowing you down. Peace to you too. Joan, how good to hear from you all the way from Scotland. It was very special to have your good company on the Sacred Earth course. I’m thinking about that course as I walk the earth in this pre=Christmas quiet & wondering if I will offer it again. Happy winter solstice to you, and I hope you are keeping warm, outer and inner. Thank you. Dear Juliet many thanks for the acknoweldgement of the seasons and our connection to them. Wishing you a happy connected joyous summer solstice. Thank you Claire. I’m having a wonderful summer solstice retreat at the bach. It’s very peaceful out here and the birds are singing. Deep gratefulness ,Juliet for your beautiful offerings…they are richly simple & lush like the sea & the land I am blessed to be grounded in, back in Tai Tokerau. Welcome back Marg, and I hope you have a relaxing summer, full of reconnections. Thank you. Ahhh, imagining that brought me immediate ease – and helped me slow down, connect deeply and take special care. Gratitude and solstice blessings from my heart to yours, Juliet! Dana, I’m so glad this connected with your responsive heart. Special care to you, yes. Thank you. Such a gentle invitation, and lovely mandala. Thank you Juliet. Thank you Miriam for receiving this offering and posting here. Thank you Hilary. I don’t have the broadband out there to catch up on blog posts, but hope to next time I’m back in town. All good wishes to you.